M&Ms are round chocolates with an “m” printed on each one. They are available in many different colors. These colors are green, yellow, blue, red, brown, and orange. They also come in different flavors such as milk chocolate, dark chocolate, mint chocolate, peanuts, almonds, orange chocolate, coconut, and peanut butter. M&Ms have also been included in many other candy products. Peanut M&M's, introduced in 1954. Forrest Mars is the founder of the Mars Company. He got the idea for M&M’s during the 1930 Spanish Civil War. He saw soldiers eating chocolate pellets with hard chocolate shells. He decided to make his own chocolate candies. He got the patent for these on March 3, 1941. 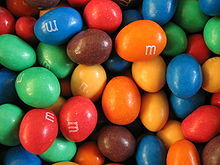 The name M&M comes from the founders name Forrest E. Mars Sr. The other M comes from the name of the president of the Hershey Company, William F. R. Murrie. The Mars Company started printing the white M on the candy in 1950. In 1954 the world famous M&M characters made their first television appearance. 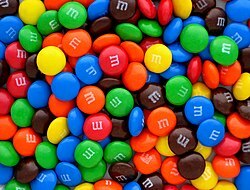 In 1980 M&M’s were sold across the world. This page was last changed on 27 March 2018, at 01:54.